Co-authored by Jacquelyn Crutchley, Chief Operating Officer of Schools for Sustainability Inc. The eco world is all abuzz over aquaponics as the latest go-to green technology. It is an effective method for raising seedlings and fish farming in closed-loop systems. With this knowledge, Schools for Sustainability Inc. trekked across an island to find this still-rare system in action in a country that has been using aquaponics since pre-Columbian times! During the last week of October 2014, the Schools for Sustainability team took a seven-day plenary trip to the Dominican Republic, where our very first school is set to be built. In addition to connecting with local politicians and the surrounding community of Monte Plata and getting legal paperwork in order, the two of us and advisor Adrienne Redd visited a beautiful organic oasis called Taino Farm. We have been planning Arcadia University's first trip to the Dominican Republic in March 2015, where students will break ground by building an aquaponics unit on the 22 acres of land that were donated to the organization. The project brought up the question of whether any similar projects are already underway in the Dominican Republic. Happily, yes! Taino Farm, located in Los Brazos, near Cabarete, in the Dominican Republic, is a growing organic farm that uses various permaculture principles. They also have several different aquaponics units on site for seedling growth and fish farming. Though the Schools for Sustainability team was on a tight schedule, we made the time for a five-hour drive (10 hours in total!) to see this magnificent farm. Our expectations were completely blown out of the water (pun intended)! The first friendly face we saw was that of Rhi, the farm's manager, who took care of our every need. Whether it was her friendly demeanor or her delicious breakfast (including the rare and delicious abiu fruit, which tastes similar to delicious flan! ), we couldn't have been happier with the service and friendship she provided. Next we met with Stuart, who is the farm's reigning aquaponics expert and our go-to guide. He was completely amused by and helpful in answering our questions. We learned about two different aquaponics systems, the materials we'll need to acquire before our trip in March, daily care, and bonus information about fish farming. We even discussed the possibility of partnering to grow a seed library together once we get our farm up and running! Stuart even waited for us to arrive at the farm later in the evening and then again early the next morning so that we could learn as much as possible before heading back to the capital of Santo Domingo. We also spoke with Victor Vasquez, a local farmer who has been with Taino Farm longer than anyone else on staff. His knowledge about Dominican farming was abundant, and like a true farmer he hurried off after our chat to take care of the animals and plants! 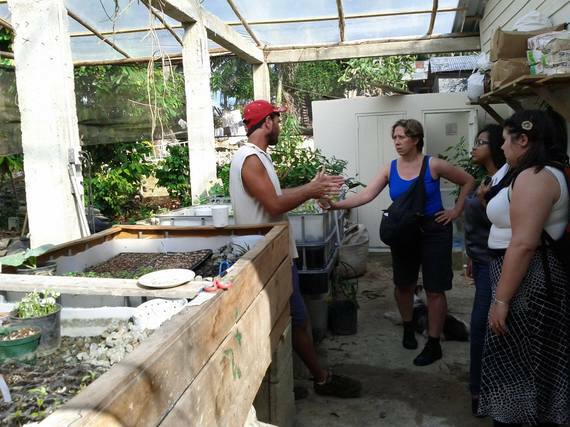 Some of our favorite moments at Taino Farm included the aquaponics tour, seeing triangle-shaped chicken coops, eating delicious organic produce (including cranberry hibiscus right off of the bush! ), learning about sustainable organic-farm practices, and exploring worm beds. Schools for Sustainability cannot wait to visit again to see how much more this farm has grown! If you are interested in more information about Taino Farm, please visit their website here. Also, please check out their Facebook page. Importantly, look into their amazing internship and volunteer opportunities here, and read about the experience here. COO Jacquelyn Crutchley is a graduate of Arcadia University, having majored in sociology, anthropology and Spanish. She interned in Guatemala and Mexico, doing medical translation and serving as an ombudsman between patients and staff. There she also taught English to students between 4 and 65 years of age. She participated in the 2012 Y20 youth conference, focusing on global food security, and was selected to represent Arcadia University for the Who's Who in American Universities and Colleges in 2013.